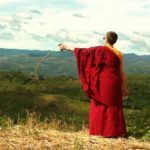 After completing the 3-year, 3-month retreat, Lama traveled in Asia on pilgrimage to Buddhist holy sites and later took students on trips to visit monasteries and sites in India and Nepal. 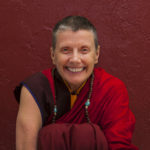 While she remained at the monastery in New York State for a few years after finishing her retreat, Lama relocated to South Florida late in 1996 where she began the first Kagyu center in Hollywood, Florida in 1997. Seven years later a donation was given to the center for the purchase of the property at 60 NW 86th Street in Miami. 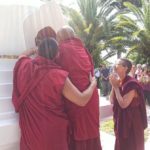 Here the sangha worked for years to raise funds to build stupas and in December, 2012 four 12-foot stupas were consecrated and sealed. 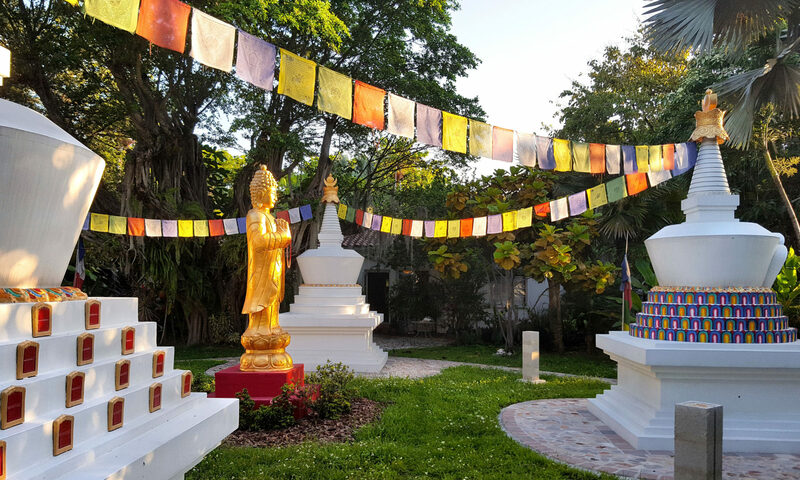 The back yard is now called “The Stupa Garden of Merit” where the four stupas face the cardinal directions and overlook the Miami Little River. The Garden of Merit has become a place of peace and harmony for the entire community. 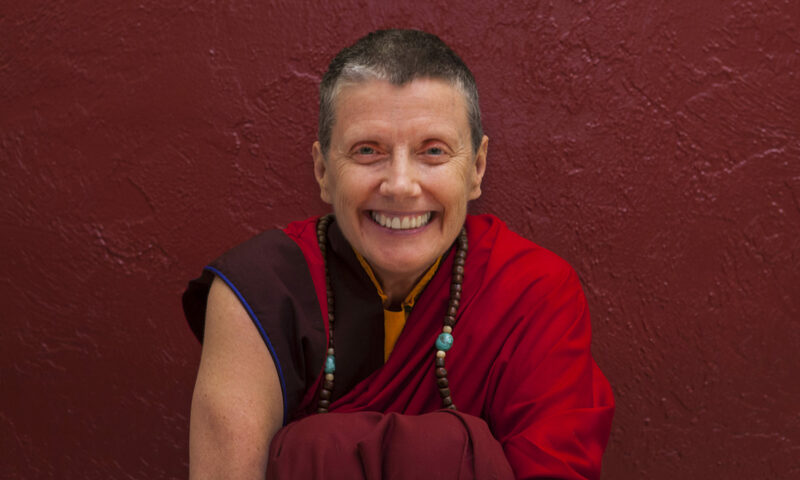 During her time in South Florida, Lama Karma Chötso has given lectures in many venues such as the Whole Life Expo in Fort Lauderdale, Sunshine Cathedral, Dania Library, St. Thomas University, Barry University, FIU, and health/wellness centers. She has visited the manatees at the Miami Seaquarium and the dolphins at the Dolphin Research Center in Grassy Key to chant mantras and give the animals consecrated waters. Lama was a member of the Board of Directors of the Interfaith Council of Greater Hollywood for many years, President for one year. 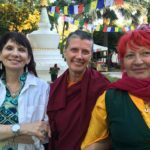 She was a Professional Volunteer Chaplain for Hospice Care of Broward County, assisting in the dying process and performing Buddhist death rituals for the deceased. Lama Karma Chötso taught meditation and Tai Qi to the inmates at Broward Correctional Facility from 1998 until 2004. 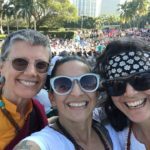 She co-taught a course in Tibetan Buddhism with Dr. Nathan Katz at FIU and was a Committee member of FAU’s Interfaith group for one year. Lama Karma Chötso’s main teachers of the Kagyu lineage were Dorje Chang Kalu Rinpoche, His Eminence T’ai Situ Rinpoche, Khenpo Tsultrim Gyamtso Rinpoche and Lama Norlha Rinpoche who had originally named the South Florida center Kagyu Shedrup Chöling. However, in 2017 the Board of Directors, Senior Students and Lama made the decision to change the name to Open Awareness Buddhist Center. OABC is now directly affiliated with Palpung International (Palpung Institute), and is under the guidance of T’ai Situ Rinpoche. Lama’s teachers from other lineages include His Holiness the 14th Dalai Lama (Gelug lineage), His Holiness Sakya Trizin (Sakya Lineage) and Trulshik Rinpoche (Nyingma Lineage). Lama Karma Chötso also teaches in Peru where she has visited twice a year for many years. 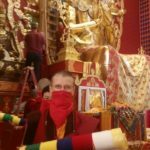 The Kagyu sangha there is strong and growing, plus they are building a 50- foot stupa in the province of San Martin near a town called Lamas. This area is on the east side of the Andes mountains and is called ‘la selva’ or jungle. The stupa will be finished in 2018 and will house a shrine room. 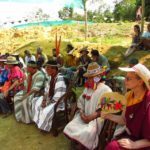 The land will eventually have retreat cabins and a community hall for Buddhist teachings and activities to benefit the local communities. Rime (non-sectarian) master, Phakyab Rinpoche, and the Geluk sangha in Lima are also involved in the stupa project. 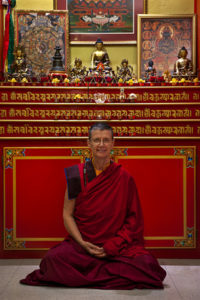 Lama Karma Chötso’s main residence is in Miami, Florida, where she lives with her rescue animals: the dog, Sengay, and two cats, Travieso and Nefertiti. Many other cats and dogs have been fostered at the center and all have found homes. Visit Dharmagraphy, Lama Karma Chötso’s photography and music.